A quote from the 21st Century Workforce Commission, National Alliance of Business (USA), “The current and future health of America’s 21st Century Economy depends directly on how broadly and deeply Americans reach a new level of literacy—‘21st Century Literacy’—that includes strong academic skills, thinking, reasoning, teamwork skills, and proficiency in using technology.” opens up a multiple avenue of thoughts on the need for special skills for the 21st century and therefore the link to the skills required for the 21st century learner and the 21st century learning environments. A decade into the 21st century, reports are still calling for urgent action to build the capacity of our students who will be the future citizens and the intellectual driving force for advances in all spheres in the digital age. Human society has witnessed three revolutions down the ages – the agrarian, the industrial and now the digital revolution and each wave has seen a new demand in terms of skill sets required to emerge successful. To take a milestone example, the birth of the letters of the alphabet, led to a demand for the skill of carving these on stone, which graduated to wielding the quill and pen, progressing into the printing press and finally into the keypad skills. Have we stopped? If one goes by the emerging technological trends, the skills required are only on the rise. Alvin Tofler in his book The Third Wave talks about every age mandating a skill that was demanded of its citizens and the digital age is no different as far as technological skills are concerned. Among the growing number of business leaders, politicians and educators buzzing about the “21st Century Skills” required of students, “if they have to be successful in the digital age” the ‘Partnership for 21st Century Skills’, (based in the U.S), has developed a vision and a framework for student success in the new global economy. 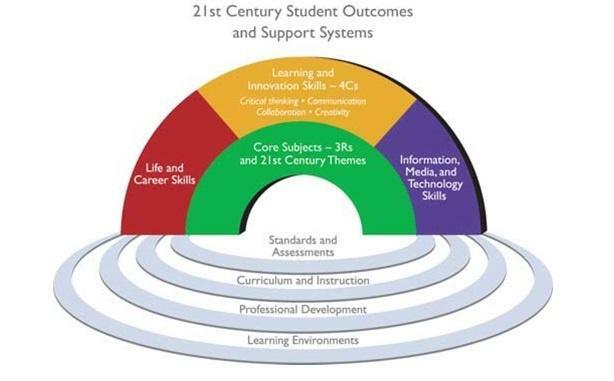 This framework presents a holistic view of 21st century teaching focusing on the support systems required for 21st century student outcomes that are multi-dimensional. It calls for building within the context of core knowledge essential skills for success in today’s world, such as critical thinking, problem solving, communication and collaboration. While advocating the mastery of core subjects (English, Reading or Language Arts, World Languages, Arts, Mathematics, Economics, Science, Geography, History, Government and Civics) it makes weaving in of the 21st century themes essential to student success to promote an understanding of the core content at higher levels on 21st century interdisciplinary themes such as Global Awareness, Financial, Economic, Business and Entrepreneurial Literacy, Civic Literacy, Health Literacy and Environmental Literacy in to the core subjects. Learning for the 21st Century is a report and mile guide (2003) that provides recommendations based on 6 key elements of 21st century learning. Interestingly, this report; designed to promote a national dialogue about 21st century skills, comes from a private-public partnership between major technology companies, the U.S Department of Education and the National Education Association that in turn consulted with leading U.S educators, researchers and organizations such as the National School Boards Association, National Coalition of Technology in Education and others. The chapter The Six Key Elements of 21st Century Learning ( ref. explanation within the box), in the report acknowledges the importance of traditional core subjects but expands them with missing elements that make the core subjects relevant to the world in which students live and eventually may work. These six elements form the "Bridge to 21st Century Learning." In this section "Media literacy" is clearly named as one of the higher-order skills that are fundamental to success in the 21st century. liation committees 2009 saw his appointment as Member of the CBSE Committee for “Promotion of CBSE Overseas”. Dr. Wasil has been honored with the prestigious National Teacher Award awarded by the Ministry of Human Resources, receiving the award from the Ex-President of India Dr. A.P.J. Abdul Kalam in September 2005. In recognition of leadership competency and contribution to Education, he was awarded the GEMS Fellowship - “Leadership for Learning: The Cambridge Network” Fellowship in January 2006 to research on Leadership Management at the University of Cambridge under Professor John MacBeath, while he was with GEMS Education, Dubai, UAE. Excellence in Education being his inspiration, Dr. Wasil has been a keen participant, keynote speaker, and Chairperson in innumerable conferences and seminars on Education both in the Gulf and in India. A thinker and writer, his articles have featured in several National and International research journals and publications. He is also the author of Pedagogy: From Perception to Perspective (published 2013), that took shape from his 3 decades of experience in education and also A Design Manual for School Building.